Electronic Vapor E-Cigarette Devices – Be aware and take care! Unfortunately, the vaping craze has reached the toddler set, according to the Missouri Poison Center call statistics. The adult market for smokeless e-cigarette devices that vaporize a nicotine-laced liquid has been booming. This means that curious kids can find themselves playing with the hand-held vaporizing gadgets and the liquid nicotine inside them. Nicotine can be a dangerous poison if swallowed or if left on the skin. Disposable e-cigarettes that cannot be refilled and used again. An e-cigarette device that uses pre-packaged replacement cartridges. An e-cigarette that has a small tank that can be refilled from a big bottle of nicotine liquid. Disposable and prefilled cartridge e-cigarettes are the least dangerous because the liquid nicotine ordinarily can’t leak out unless the cartridge is somehow broken. However, the refillable devices need to be refilled from larger containers, which are not fitted with child-resistant caps. The liquid nicotine easily flows out and can be swallowed or spilled onto the child’s skin or clothing. The nicotine is so concentrated that even a small amount can be toxic. Symptoms occur within minutes and include a stinging bitter taste, drooling, gagging, vomiting, and dizziness. In severe cases, seizures and a fatal drop in blood pressure could occur. Children’s natural behavior and curiosity automatically puts them at risk for dangers within their reach. They also like to play with interesting things they find and to imitate the grown-ups in their lives, who just might be vaping with e-cigarettes. The final attraction for young children can be the array of colors and candy flavors that the nicotine liquid comes in. If e-cigarettes are in your home, be aware and take care! Always keep e-cigarette devices and liquid nicotine locked up and out of the reach of children. Use caution when refilling e-cigarettes. Protect your own skin when handling the products. Follow the specific disposal instructions on the label. 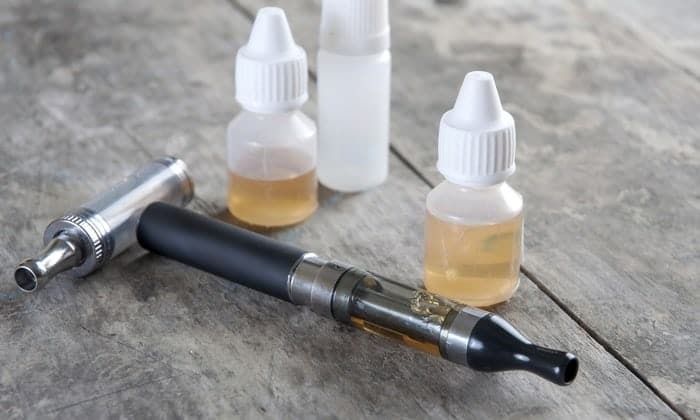 If you think someone has been exposed to an e-cigarette device or liquid nicotine, call the Missouri Poison Center at 1-800-222-1222 immediately. Poison centers give expert advice fast, over the phone. We can help you and your family with poison emergencies and with questions about poisoning. You can call day or night, 7 days a week, any day of the year. 1-800-222-1222 to speak with a poison expert.